Amami's supporters at a sit-in. Photo shared on Twitter by @awicksell. Tunisian blogger and human rights activist Azyz Amami was arrested last night at approximately 11pm in La Goulette for the alleged possession of 700 grams of cannabis on his person. Amami was beaten by police officers who arrested him, as confirmed by his father. His friend, Sabri Ben Mlouka, was also arrested. Both young men may face one to five years in prison, under Tunisia's notoriously harsh penalties for drug use. Amami is currently being held in the Carthage police station. His first trial hearing is scheduled to take place at 9am on Thursday, May 15. He has denied all charges, and has refused to sign any documents. A protest in support of Amami took place on May 13 in downtown Tunis. Amami has been one of the most vociferous advocates on behalf of the families of martyrs killed and harmed during the 2010-11 uprising, and in fighting for their rights. He was jailed on January 6, 2011, and was psychologically and physically tortured while held in the Ministry of Interior. Amami has been blogging against state abuse and police aggression since 2008, and has worked on the Ammar 404 campaign to demand an end to state surveillance and censorship, along with some of Tunisia’s most influential cyberactivists. He is frequently at the forefront of social justice movements in Tunisia, and is considered by many to be a symbol of the revolution. Fabricated charges of marijuana possession is a classic practice that has traditionally been used by Tunisian authorities both before and after the uprisings to disguise politically motivated arrests. 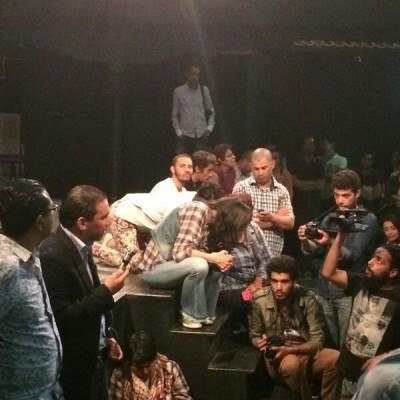 Friends of Azyz organized a sit-in in Al-Hamra theatre, in Tunis suburbs, in which words of support and solidarity were heard from Azyz’s father, lawyers and supporters.